SynaptiCAD's timing diagram editors now support mixed-signal TRO waveform import, Analog and Digital waveform viewing, fast waveform state searching, and faster performance when displaying large files. New versions of DataSheet Pro and WaveFormer Pro, SynaptiCAD's timing diagram editing and stimulus generation tools, are available on Windows, Linux, and Solaris. The tools can now import binary TR0 waveform files generated by analog simulators such as Synopsys HSPICE and Nascentric's OmegaSim during transient response simulation. Ramon Acosta, VP of Engineering at Nascentric reports that "We use SynaptiCAD's waveform viewer to debug circuits within OmegaSim AMS, Nascentric's analog mixed-signal Fast-SPICE simulator. I found it intuitive to view, measure and combine imported waveforms and to generate stimulus using WaveFormer." 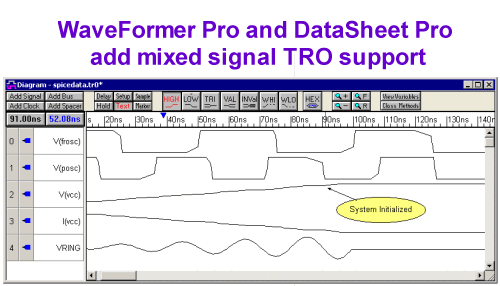 Both analog and digital waveforms from Agilent's Mixed-Signal Oscilloscopes can now be imported as timing diagrams into the timing diagram editors. The imported waveforms can then in turn be translated into test bench code or used to create stimulus for pattern generators and ATE equipment. The new versions are able to generate VCD waveform files which can be used to feed ATE stimulus flows. In addition, import of extended VCD files was enhanced to recognize the input/output direction of the waveform data. In a related enhancement, the tool's ability to generate tri-state enable signals for pattern generators was improved to recognize output data from the device under test as a condition to tri-state drivers from a pattern generator attached to bidirectional signals. The internal waveform compression engine now compresses data sets up to 10x better than previous versions for repeating waveform data (compression rates of up to 2000 times smaller than VCD). Waveform repetitions identified by the tools can be accessed by third-party programs via a CORBA-based API. Rendering speed for digital waveforms was also increased to handle extremely large data sets. A number of new features were added for viewing and editing timing diagrams. The Quick Search control can search for occurrences of a user-specified bus value in a selected set of signals. Time marker cursors can be placed on the diagram to display the states of all signals at a given point in time. Signal direction, export state, and vertical position are now shown in the signal label window. Geometric shapes such as ellipses and rectangles can be annotated to a diagram to highlight areas of interest. New tutorials were also added to address topics such as creating and editing analog waveforms, generating reactive test benches, and performing automated comparison of sets of waveform data. WaveFormer Pro is available on Linux, Solaris, and MS Windows (including MS Vista). A perpetual license sells for $2875 node locked on Windows. SynaptiCAD also sells DataSheet Pro (an upgrade to WaveFormer that includes the ability to embed linked OLE images into documents and supports editing multiple diagrams simultaneously), and Timing Diagrammer Pro (a reduced version of WaveFormer without the waveform translation features). WaveViewer, a free version capable of displaying results of analog and digital simulations as well as waveforms acquired from test equipment, is available for download at http://www.syncad.com/freeviewer.htm .